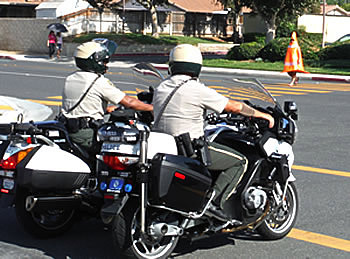 Moreno Valley police officers cited 12 people for failing to yield to pedestrians in crosswalks during a “Pedestrian Decoy Program” from 9:00 a.m. – 10:00 a.m. today in the area of Eucalyptus Avenue and Running Deer Road in Moreno Valley, Sheriff’s officials reported. The program utilized an undercover police officer who walked back and forth at a crosswalk located at the intersection of the two roads. While in the past officers have been dressed like normal citizens, the officer undercover in today’s operation was dressed in an orange traffic cone suit to appear more visible, according to a Riverside County Sheriff’s report. The pedestrian decoy operation was conducted in response to complaints from the public and local crossing guards. The complaints alleged that various vehicles were not stopping for people in intersection crosswalks throughout the city, according to Sheriff’s Sgt Bill Guimont. The intended purpose of the program was to “make motorists more aware of their surroundings and to be vigilant while driving,” Guimont said. Many of the 12 motorists who were stopped claimed they had never seen an orange traffic cone, according to Guimont. Eight other motorists were cited for different violations.